I have a Koso RX2n fitted in my Luego which stops reading above 50mph. I have fitted a new sensor but suspect that its actually moving out of position although it does appear to be quite rigid and its strange its always above 50. Could you all share pics of your setup so that i can have a think about where to relocate it. My acewell sensor is on the prop with a fairly flimsy ali bracket but never had problems, apart from magnet falling off initially. Are you running a Sierra diff? 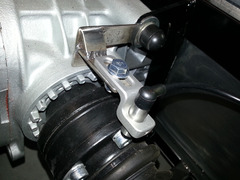 If so I've used the bolts that hold the driveshaft to the diff as pick up points,6 bolts evenly placed. My sensor pics up on a plate that is attached to the diff. The bracket for the sensor is bolted onto a lower chassis rail. How many points is it picking up off? Its only picking up on one point. Im guessing if I need a more robust bracket and more pickup points. I can't remember the minimum Koso recommend but pretty sure it's more than one! Saying that is it a sensor that can pick up metal bolts, or is it a old one using a magnet? So it's got a plate added for pick up point? It senses the bolts. Its a Koso RX2n sensor like the one in CosKev3 pic.